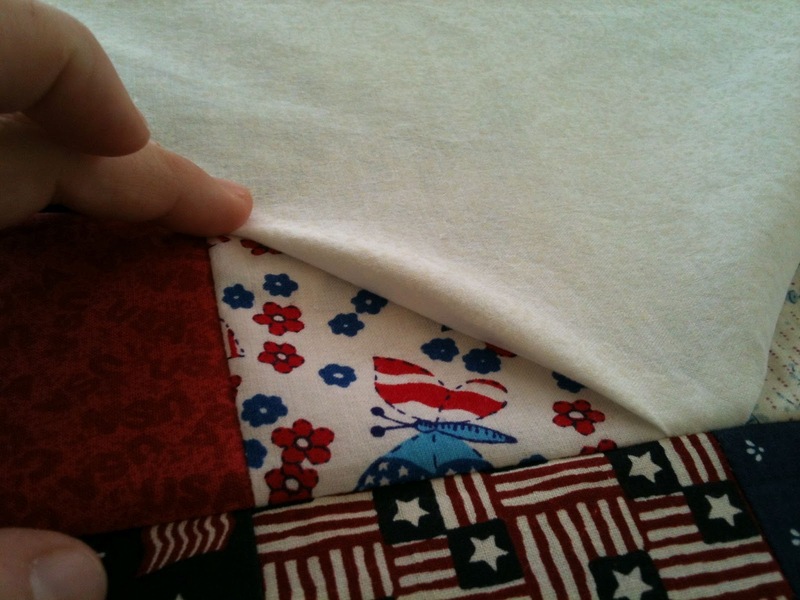 Sarcastic Quilter: Do your mistakes dictate your quilting design? 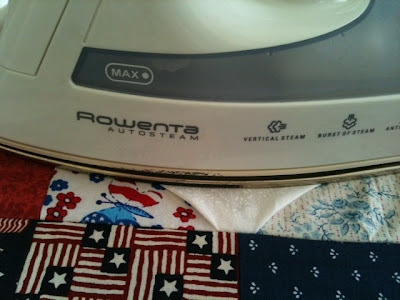 Do your mistakes dictate your quilting design? One of the Made in Cherry QAL top I'm working on is complete. The original plan was to work 2 of these tops simultaneously and donate them to Quilts of Valor. I cut the colored squares both at the same time but started sewing only one first and I am GLAD I did. The squares and triangle points went together quickly and easily. Then I cut the background fabric for both but only sewed one. I followed the instructions but I still had problems. I don't know if it's my cutting (likely), sewing, or the background size (I am doing the 60x60 versions). More than likely, I did something wrong. So I had to get creative. When I lined up the pieces, I had excess in the middle where the triangle was supposed to meet at a nice point. Instead, you see where there is a big gap. 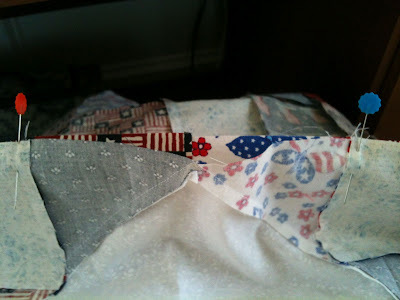 I decided to let the points get sewn off on the white triangle and then iron the excess white fabric down. Here's what I mean. I unstitched a little on the points. 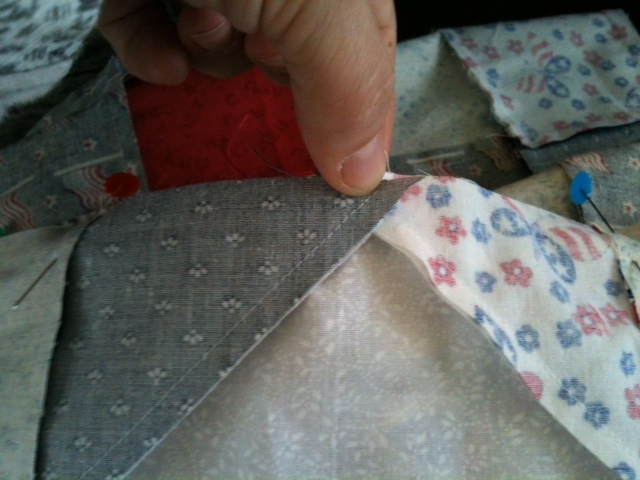 Then I refolded where they all meet to lay them flat & sewed it down. This is the fold sewn without pressing. 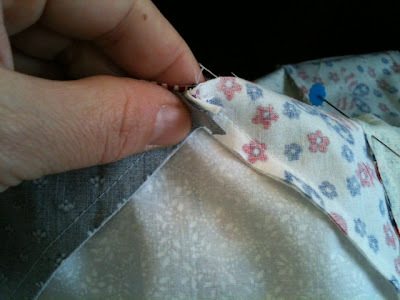 Press the folds right over the colored fabrics. Here's what it looks like once pressed and why you can see if I quilt it so that edge stays down, it will be just fine. 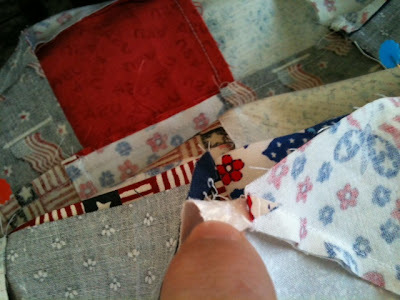 So once again, it looks like my quilting is to be deteremined by my screw up on the piecing. One day, I won't need to do this. Lastly, since I want to donate this as a QOV, I needed to make it slightly longer so I added a strip of extra squares and some more background fabric. 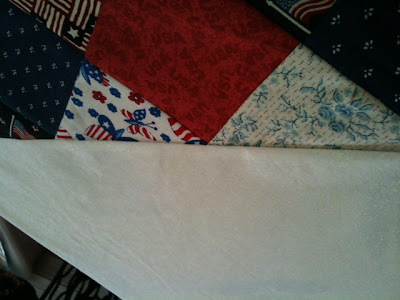 It's definately large enough now and come quilting time, I will quilt that white background down tight. As for the second top, I'm not sure if I'll work another star with all the cuts, re-checking the measurements of my background fabrics or if I'll choose another scrappy pattern and just go from there. Maybe stripes of background and pieced squares or maybe a disappearing nine-patch. Even thought it gave you troubles, it looks great!! 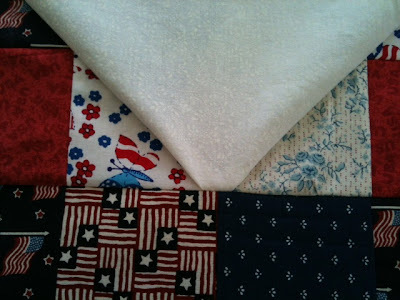 This quilt top looks great. I wonder if you had started sewing at the point (1/4" away from the point)out and then again on the other side it would have worked out. It seems to me that that is what I have done when I had set in triangles but it has been a while. However, since this quilt looks great, I would do the other, too. Clever fix! Your quilt top is just wonderful. Wasn't this quilt along fun? glad you could fix it. it's a lovely quilt and such a great cause. good luck with the second one. Last Swoon blocks. Here's a taste of the top.